Since I started in the High Five events Splash and Dash Series back in 2008, I've really enjoyed the hard but short aquathlon style racing. I never took part in any of the Sunrise Aquathlons that we organized back in the UK, but do recall doing one of the very first ITU aquathlon races back in 2001 or 2002, at Salford. This year has been a bust though. I entered the complete High Five events series, but have missed all but one race, and that was cancelled due to lightening just before race time. Tomorrow, 7/21 is the only one I'll be in town for in the remainder of the series, so I need to make it worth the race. 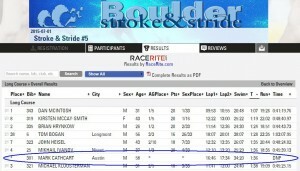 Over in Boulder they organize a slightly shorter Stroke and Stride Series , I headed over to one race full of anticipation, looking forward to the 750m Swim and 5k Run, only to find on arrival that I'd left my built-up run shoes back at Kates' apartment. I switched to the long couse swim, 1500m which didn't work out so well, even though I swam in my "speed suit". I did the transition, ran through the timing mat and quit. The next event I was better prepared, but a Kate and I drove toward Boulder Reservoir, the weather was closing in.